September 1, 2006John F. Kennedy Space Center Americas gateway to the universe Spaceport News http://www.nasa.gov/centers/kennedy/news/snews/spnews_toc.html Vol. 45, No. 17 Weather prime factor in delaying Atlantis launchNASA selects crew, cargo transportation partnersA s NASA prepares to close one door  the Space Shuttle Program  in 2010, the agency is making strides to open another. NASA is making an unprecedented investment in commercial space transportation services with the hope of creating a competitive market for supply flights to the International Space Station. When commercial enterprises turn the journey to low-Earth orbit into a profit-making business model, NASA will be free to focus on goals that are more appropriate for government, such as exploration of the moon and Mars, said NASA Exploration Systems Mission Directorate Associate Administrator Scott Horowitz. Under the flag of Crew Orbital Transportation Services, NASA solicited proposals from industry for Earth-to-orbit space flight demonstrations of external (unpressurized) cargo delivery and disposal, internal (pressurized) cargo delivery and disposal, and internal cargo delivery, return and recovery. There is an option for crew transportation, as well. NASA has selected Space Exploration Technologies (SpaceX) in El Segundo, Calif., and Rocketplane-Kistler in Oklahoma City, Okla., for phase one, which is (See COTS, Page 3) I n the not too distant future, Orion will be a steady visitor to the International Space Station and eventually the moon. Named for the familiar constellation, the new crew exploration vehicle that NASA has named Orion is the vehicle NASAs Constellation Program is developing to carry a new generation of explorers back to the moon and later to Mars. Orion will succeed the space shuttle as NASAs primary vehicle for human space exploration. Orions first flight with astronauts onboard is planned for no later than 2014 to the International Space Station. Its first flight to the moon is planned for no later than 2020. Orion is named for one of the brightest, most familiar and easily identifiable constellations. Many of its stars have been used for navigation and guided explorers to new worlds for centuries, said Orion Project Manager Skip Hatfield. Our team, and all of NASA and, I believe, our country grows more excited with every step forward this program takes. The future for space exploration is coming quickly. NASA looks to stars to name crew exploration vehicleI n the last week of August, Floridians were casting their eyes from theskies to coast to coast, wondering if either the lightning storms would affect the launch of Space Shuttle Atlantis or the hurricane knocking on Floridas coast. It was both, as it turned out. On the morning of Aug. 29, NASA mission managers decided to roll back Atlantis before the effects of Tropical Storm Ernesto reached Kennedy Space Center. Later that day when Atlantis was halfway back to the Vehicle Assembly Building and the intensity of the storm began to drop, mission managers decided to return the shuttle back to the pad. The lighted launch window for STS-115 extends to Sept. 13, but NASA had hoped to launch by Sept. 7 to avoid a planned Russian Soyuz rocket launch bound for the International Space Station. Atlantis will require eight days of launch preparations once it returns to Launch Pad 39B. The shuttle was poised on Aug. 25 for launch to the International Space Station on mission STS-115 two days later until a strong lightning bolt hit the lightning rod on top of the fixed service structure. The rod performed as designed, capturing the bolt and sending it to ground via the catenary wire. (See more information about the device on pages 4 and 5.) But it did not leave the orbiter undisturbed. (See WEATHER, page 5)NASA MOVED Space Shuttle Atlantis off Launch Pad 39B on Aug. 29 due to Tropical Storm Ernestos track. Later that day, Atlantis returned to the pad because the storms predicted intensity dropped. SPACEPORT NEWS September 1, 2006 Page 2 Awards The Kennedy Update Jim Kennedy Center Director CENTER DIRECTOR Jim Kennedy visits Parrish Early Care Education center, one of many recipients of United Way in Brevard County. Pat Simpkins to lead new directorate at KSCP atrick Simpkins has been appointed the director of Kennedy Space Centers new Engineering Directorate that is to begin operation in October. The new 600-person Engineering Directorate at KSC will centralize the centers engineering activities, processes and personnel into one organization that will have an independent reporting line of authority. It will ensure the highest quality of engineering rigor at the center. Simpkins will assume the responsibilities of the directors position immediately to ensure that all issues associated with the reorganization are addressed and to help with the successful transition from concept to operations. Bill Parsons, KSCs deputy director, will assume the responsibilities of acting director of the Advanced Planning Office, Simpkins most recent position. His past experience has positioned him well for his new role. My experience ranged from engineering to integrating IT systems, to Human Resources, to Safety and Mission Assurance and, more recently, Advanced Planning, said Simpkins. All along the way, I have worked for, and with, scientists, engineers, human resource professionals and business people from across the agency, including JPL and contractors. Each experience added a little piece to the overall puzzle of leading a big organization into a new era of exploration, while safely and reliably building on our legacy. Simpkins recently served as chairman of the Organizational Development Team for the Engineering Directorate. In this capacity, he guided the development of this reorganization, one of the most significant changes made to the centers structure since the transition from the Apollo Program to the Space Shuttle Program. Regarding his expectations for the new directorate, Simpkins said: Its all about the mission. The (See DIRECTOR, Page 5 ) biggest expectation is that we will continue to provide better and better service to all the programs and projects that wish to leverage KSCs engineering expertise. This includes continuing our outstanding support to existing programs but also providing excellent support to all our future customers. This agency and this nation have collectively decided to finish what we started, go back to the moon and (go to) Mars, and all of that starts here. He added: The new Engineering organization will be strongly focused on supporting all the missions outlined in the G reetings! Although Hurricane Ernesto delayed the launch of STS-115, I am so proud of our employees and the teams that worked so hard to get Atlantis ready so soon after the previous launch on July 4. Thanks go out to the Shuttle Processing team, who expertly prepared Atlantis to ride out the storm. Kudos especially to the team who figured out a way to reach those antenna actuator bolts in Atlantis payload bay and replace them quickly, efficiently and safely. As this issue was being finished, the work force was not only preparing the center for possible bad weather, but also preparing their own family for the effects of a hurricane. As we look ahead to the next mission and others to follow over the next four years, we must also look beyond 2010 and what lies in store for the space station. Keeping that outpost staffed and supplied is a challenge NASA is undertaking through commercial space transportation services. We hope two Space Act Agreements signed with SpaceX and Rocketplane-Kistler will lead to the continued success of research on the space station. Looking ahead to a nearer goal, in October we will be kicking off the Combined Federal Campaign for United Way. Last week, I visited a few of the local organizations who benefit from our contributions. They included the Parrish Early Care Education center (see the photo at right), Brevard Alzheimer Foundation and North Brevard Sharing Center. This year, rather than competing for percentages of donations, Id like us to focus on the total amount donated and how individuals in our community benefit. Some of our fellow workers have had needs met by organizations in United Way. Others benefit from the time they donate as volunteers. At KSC, we regularly acknowledge and celebrate the unique talents and contributions of our work force, which embodies a diversity of cultures and interests. We annually honor that diversity with a themed celebration open to contractors and civil servants alike. This years event takes place Sept. 9 at the Radisson Pavilion in Cape Canaveral. The theme, suggested by one of our own employees, is Diversity: A Cord of Many Strands Is Not Easily Broken. Congratulations to Vernon Blanchette for his winning entry in the theme contest. I hope you all will consider sharing in our celebration and enjoy listening to guest speaker and my personal good friend Dr. Julian Earls, who is a retired director of the Glenn Research Center. (See page 8 for more information.) Continuing with my theme of our special employees, I am happy to announce several of our management staff have been reassigned to positions in the new Engineering Directorate. Foremost is Director Patrick Simpkins. You can read more about him and his new role (below) in this issue of Spaceport News Other assignments are Deputy Director of the Engineering Directorate Scott Kerr, Director of the Design and Development Engineering Office Oscar Toledo and Director of Safety and Mission Assurance Shannon Bartell. Bartell will replace Denny Kross, who will be retiring in January. Kerr and Simpkins will be a dynamic team, ably navigating the center through the challenges that lie ahead. I know theyll be forceful contributors to our success. Have a great week, everyone, and be safe! Page 4 SPACEPORT NEWS September 1, 2006 How safe is Kennedy Space Center f ro S ince Florida is considered the lightning capital of the United States, Kennedy Space Center is hardly immune from the weather phenomenon. Yet strikes dont happen very often when a shuttle is on the launch pad. The strike on Aug. 25, therefore, was not all that unusual, however, the intensity of the strike was. The result delayed a significant launch to the International Space Station. How does the center protect its facilities and hardware from effects of lightning?Lightning protection systemsKennedy Space Center operates extensive lightning protection and detection systems in order to keep its employees, the 184-foot-high space shuttle, the launch pads, payloads and processing facilities from harm. The protection systems and the detection systems incorporate equipment and personnel both at Kennedy and Cape Canaveral Air Force Station (CCAFS), located southeast of Kennedy. Protection at the pad Some Kennedy facilities that incorporate extensive lightningshielding devices include the service structures at Launch Pads 39A and 39B, the Vehicle Assembly Building and the Orbiter Processing Facility. An 80-foot-tall fiberglass mast on top of the fixed service structure at each pad is the most visible means of protecting the structure itself, the shuttle while it is on the pad, and the enclosed launch equipment. The mast supports a 1inch stainless steel cable that runs over its top. This cable stretches 1,000 feet in two directions, and each end is anchored and grounded. Its appearance is similar to that of a suspension bridge tower and its supporting cables. A 4-foot-high lightning rod on top of the mast is connected to the cable. The rods purpose is to prevent lightning current from passing directly through the space shuttle and the structures on the pad. Any strikes in this area would be conducted by the cable, called a catenary wire because of its shape, to the grounded anchor points. Other grounding systems in the Launch Complex 39 area include a network of buried, interconnected metal rods called the counterpoise that run under the launch pads and surrounding support structures. All structures in the area are grounded, including the Vehicle Assembly Building. Additional protection devices at the pads include a grounded overhead shield cable to protect the crew emergency egress slidewires, attached to the fixed service structure. Grounding points on the pad surface connect the pedestals that support the mobile launcher platform to the pad counterpoise. The platform itself has electrical connections in its twin tail service masts that make contact with the space shuttle. These connections complete the system that conducts any lightning-related electrical discharges safely away from the space plane. Most other launch pads at CCAFS have similar overhead wire lightning protection systems. Overhead gridwire systems protect hypergolic fuel and oxidizer storage areas at the pads. The huge 900,000-gallon liquid hydrogen and oxygen tanks at each pad are constructed of metal and do not need overhead protection since they provide their own grounds. Away from the pad, the shuttle is well protected from both inclement weather and lightning when it is in the Vehicle Assembly Building. This 525-foot-high structure, one of the largest in the world, has its own system of 11 lightning conductor towers rising 25 feet high on its roof. When lightning hits the system, wires conduct the charge to the towers, which then direct the current down the sides of the building and into its foundation pilings that are driven into bedrock. After leaving the building, the space shuttle is vulnerable to lightning strikes as it is transported to the launch pad. This trip takes about six hours. The primary method of reducing lightning risk is by scheduling rollout during periods of very low lightning probability  typically in the late night and early morning hours.Launch pad detection systemsA lightning measuring system is located at the launch pads so that any electrical activity in the immediate area can be continually observed, recorded and assessed. Data gathered by its sensors and cameras is sent directly to the Launch Control Center so NASA personnel can determine when it is safe to launch the shuttle. One of the monitors closest to the shuttle is the Catenary Wire Lightning Instrumentation System This system senses lightning currents in the wire and evaluates them to see what potential they may have for causing damage to sensitive electrical equipment. The current sensors are located at each end of the catenary wire, and they detect and record lightning strikes to provide potential damage assessment data for the lightning instrumentation system. Another launch pad monitoring system, the Lightning Induced Voltage Instrumentation System detects and records any transient electrical impulses that might occur in space shuttle electronic systems or on the vehicles skin. The system is installed in the mobile launcher platform and monitors conditions while the shuttle is on the way to the launch pad via the crawlerway and at the pad itself. Voltages and currents may be induced by nearby lightning even if the pad is not directly struck. The electromagnetic fields from the intense lightning currents are enough to cause currents to flow in nearby conductors. Data recorded by both systems are compiled and sent to the Launch Control Center through the computers of the Lightning and Transients Monitoring System. A new Sonic Lightning Locator being tested at the shuttle launch pads precisely determines the strength and exact location, to within 5 meters, of any lightning strikes within the immediate area of the pad. This helps shuttle engineers assess the need to conduct additional tests on sensitive systems after nearby lightning events. The sonic lightning locater uses an electric field detector and an array of acoustic detectors to locate the lightning contact point with great precision. Visual detection of lightning activity is also essential. A network of video cameras positioned to observe the fixed service structures lightning mast and the top of the shuttles external tank are linked to television monitors in the Launch Control Center. Any lightning flashes can be seen on the screen and recorded for later analysis. These data, along with the launch pad protection systems, help verify and calibrate the lightning detection systems. The elaborate lightning detection and protection systems at Kennedy have proven their worth the hard way. The lightning masts at Launch Pads 39A and 39B are struck about five times per year, sometimes with a space shuttle on the pad. Prior to the Aug. 25 strike, there had been no damage to any equipment.For more information about NASA lightning detection systems, go to http://wwwpao.ksc.nasa.gov/ kscpao/nasafact/pdf/ Lightning-06.pdf on the Web. Page 5 SPACEPORT NEWS September 1, 2006 agencys strategic objectives. First, and foremost in all our minds, is the continued safe and exciting shuttle missions, the processing of ISS hardware and payloads, the launch of expendables, and the design of future systems. It is my intention that all those mission responsibilities are supported to the fullest extent. Kennedy said, Pats unique balance of technical and staff experience will be instrumental in helping with the change necessary to make this new directorate a success. I am confident that he will continue to be successful, and will be instrumental in guiding this new organization in coordination with all other stakeholders as we pursue the Vision for Space Exploration. Simpkins replaces Steve Altemus, who recently accepted another position at the Johnson Space Center.DIRECTOR . .(continued from Page 2)A lightning measuring system is located at the launch pads so that any electrical activity in the immediate area can be continually observed, recorded and assessed. Data gathered by its sensors and cameras is sent directly to the Launch Control Center so NASA personnel can determine when it is safe to launch the shuttle. After the lightning strike, personnel on individual systems examined data for their systems. Most were cleared; however, some data indicated a disturbance on the hydrogen vent arm of the fixed service structure. The mission management team decided further analysis was needed. The launch date was first postponed at least 24 hours and later 48 hours to Aug. 29. In the meantime, Tropical Storm Ernesto in the Caribbean south of Florida was being monitored. Central Florida was placed on a hurricane watch Aug. 29 and what is known as HURCON IV status on Kennedy Space Center. ro m lightning strikes?WEATHER. .(continued from Page 1)T he Kennedy Space Center Hurricane Plan designed to protect KSC facilities and personnel will be implemented if sustained winds of 50 knots or greater are predicted. The space shuttle will be rolled back from the launch pad if the peak wind is forecast to reach 79 mph (70 knots). The rotating service structure cannot be moved after the sustained wind exceeds 46 mph (40 knots). Rollback of the space shuttle from the launch pad to the Vehicle Assembly Building must be completed before the sustained wind reaches 46 mph (40 knots), 69 mph (60 knots) in gusts with no lightning within 20 nautical miles. Depending on the current vehicle configuration in the Vehicle Assembly Building, preparations for rollback begin between 40 and 47 hours before rollback weather constraints are expected to be reached. This period may be as long as 72 hours if more than one space shuttle is involved in the rollback plans or if the payloads require servicing. Based upon the forecast for the onset of 50-knot winds, the KSC director, in coordination with the commander of the 45th Space Wing, will establish when a Hurricane Condition status is to be declared at KSC and Cape Canaveral Air Force Station and later upgraded when conditions warrant. These decisions are made in consultation with the Eastern Range Weather Operations Center and the KSC emergency preparedness officer. The KSC Emergency Operations Center (EOC) will be activated 72 hours before winds are forecast to reach a sustained velocity of 58 mph (50 knots). The KSC emergency preparedness officer is responsible for directing hurricane-associated activities from this facility until after the storm. If a launch countdown is in progress, a downrange weather advisory will be issued by the shuttle weather officer to the Mission Management Team for its consideration if the wind in the solid rocket booster recovery area is forecast to exceed a sustained velocity of 30 knots (26 knots) during retrieval operations. Seas in excess of Sea State 5 (8-13 feet) may also be a factor considered by the Mission Management Team.Rolling back a shuttle when hurricanes hover near A LIGHTNING strike occurrs on Launch Pad 39B on August 25 at 1:49:17 p.m. The lightning strike caused the mission management team to scrub the launch of mission STS-115 for 24 hours in order to review all electrical systems on the space shuttle and the launch pad ground support equipment. CRAWLER-TRANSPORTER No. 2 nears Launch Pad 39B (in the background, right). The tip of the external tank can be seen above the rotating service structure surrounding the shuttle. The crawler was moved nearby while the mission management team decided how to protect the Space Shuttle Atlantis from Tropical Storm Ernesto. On Aug. 29, Atlantis first began to roll back to the Vehicle Assembly Building, then returned to the pad when the storms intensity dropped. Page 6 SPACEPORT NEWS September 1, 2006 First Ares I flight test targeted for April 09 at KSC Remembering Our HeritageE ven as New Horizons cruises toward the edge of the asteroid belt and a date with Jupiter, the spacecraft that revolutionized our knowledge of that giant planet more than 25 years ago made history again last month. On Aug. 15, NASAs enduring Voyager 1, already Earths farthestflung robotic ambassador, became the first spacecraft to reach a distance of 100 astronomical units (AU) from the sun. Thats 100 times farther from the sun than the Earth is, equivalent to 9.3 billion miles or 15 billion kilometers. Though New Horizons will also reach 100 AU, it will never pass Voyager 1, because Voyager was boosted by multiple gravity assists that make its speed faster than New Horizons will travel. Voyager 1 is escaping the solar system at 17 kilometers per second. When New Horizons reaches that same distance 32 years from now, propelled by a single planetary swingby, it will be moving about 13 kilometers per second. Voyager blazed an historic trail of exploration across the giant planets and out into the distant heliosphere. Now Hew Horizons follows, almost 30 years later, exploring the suns population of Kuiper Belt ice dwarfs for the first time. Voyager still making history after 25 years THE VOYAGER-1 spacecraft (right) was re-encapsulated within its payload in Spacecraft Assembly and Encapsulation Facility-1 for launch in 1977. By Linda Herridge Staff Writer N ASA held a Constellation Exploration update on Aug. 27 at Kennedy Space Center to provide an update on the progress of the Ares I-1 flight test project, the Project Orion crew vehicle and Ares V cargo launch vehicle. The Ares I-1 flight test strategy includes crew exploration vehicle pad and ascent abort tests at White Sands Missile Range in New Mexico, and the Ares I development flight test, Ares I ascent tests and Ares I orbital tests, which will all take place at KSC, said Jeff Hanley, Constellation Program manager at Johnson Space Center in Houston. Flight test objectives will include control of the following: a dynamically similar vehicle to the one that will actually be used; an integrated stack; first stage/upper stage separation; atmospheric entry dynamics and chute performance; first stage roll torque measurements from the solid motors; and assembly and recovery operations concepts of the Areslike first stage at KSC. We are targeting April 2009 for the first test flight, Hanley said, adding the test site will be Launch Pad 39B, targeted to be available by 2008. Steve Cook, exploration launch projects manager at Marshall Space Flight Center in Alabama, presented an overview of the Ares I-1 system. This included the Orion crew vehicle simulator, upper stage simulator, and interstage and first stage segments. The first stage will use an existing motor from mission STS-114 and an aft skirt that are here at KSC. The crew launch vehicles first stage processing will include teams from KSC, Glenn Research Center in Cleveland and Marshall to build the upper stage and transport it to KSC. Cook showed a video animation of crew launch vehicle stacking inside the Vehicle Assembly Building. The stacked vehicle will be transported to the launch pad using the crawler transporter and the mobile launch platform. Cook said wind tunnel tests using vehicle models with various protuberances have been performed at Marshall, the Langley Research Center in Virginia and Boeing. Abort modeling simulations are being performed at NASAs Ames Research Center in California. Fabrication of ARES-1 upper stage vehicle flight hardware is in the works at Glenn. The upper stage will be assembled at the Michoud Assembly Facility in Louisiana. Cook said the upper stage will utilize the J-2 engine. Development and testing is ongoing at NASAs Stennis Space Center in Mississippi, including integrated power head demonstrations and the J-2X component development injector phase. Every successful test firing and space shuttle launch allows the team to gather more test data towards our ultimate goals, Cook said. Stennis is collaborating with the U.S. Air Force to test the RS-68 engine for the Ares V core stage to understand how they can best work together on the engine. Skip Hatfield, crew exploration vehicle project manager at JSC, said the launch abort system is being developed at Langley. Development of the crew module is at JSC, and the service module and spacecraft adapter at Glenn. Mockups of each segment are serving as pathfinders to help understand the general outline of the vehicle. Tests to characterize thermal protection materials for the heat shield are being performed at Ames Research Centers Arc Jet Facility, as well as at JSC. Wind tunnel tests are being performed to gain knowledge about flow patterns around the capsule during re-entry. 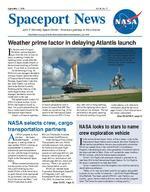 Page 8 SPACEPORT NEWS September 1, 2006 John F. Kennedy Space Center Managing editor. . . . . . . . . . . . . . . . . . . Bruce Buckingham Editor. . . . . . . . . . . . . . . . . . . . . . . . .Anita Barrett Copy editor . . . . . . . . . . . . . . . . . . . . .Corey Schubert Editorial support provided by InDyne, Inc. Writers Group.NASA at KSC is located on the Internet at http://www.nasa.gov/centers/kennedyUSGPO: 733-049/600115 Spaceport News Spaceport News is an official publication of the Kennedy Space Center and is published on alternate Fridays by External Relations in the interest of KSC civil service and contractor employees. Contributions are welcome and should be submitted two weeks before publication to the Media Services Branch, IDI-011. E-mail submissions can be sent to Jeffery.Stuckey@ksc.nasa.gov. TURTLES . (continued from Page 7) M ake your plans now to celebrate one of the many reasons that Kennedy Space Center is special at the 2006 Diversity Event from 6:30 p.m. to midnight Sept. 9 at the Radisson Pavilion in Cape Canaveral. With the theme, Diversity: A Cord Of Many Strands Is Not Easily Broken, the event will feature guest speaker Dr. Julian Earls, retired center director of the Glenn Research Center. Dr. Earls is replacing Ms. Tish Sheets from NASCAR. Tickets cost $25 and can be purchased from the Office of Diversity and Equal Opportunity, HQ Room 2327, or from the following people: Lisa Arnold Headquarters fourth floor, 867-7246; Linnette Daniels Hangar N (cape side) room 200, 853-9261; Maxine Daniels Space Station Processing Facility, room 3228X, 867-5976; Agnes Vargas Operations and Checkout Building, room 1056, 867-3004; and Latasha Walker, Logistics Building, room 2710F2, 861-7439.NASCAR official to speak at 2006 KSC Diversity Event T he annual United Way fundraiser campaign is coming to a close among the SGS/JBOSC, CAPPS and KICS contractors. Employees are urged to consider how they can make a difference in the lives of their families, friends, neighbors and co-workers in their communities. Contributions can be as broad as the community care fund that comprises 91 local health and human services, or narrowed to a targeted group or even a specific agency. At press time, SGS employees had already totaled more than $80,000. Thanks to the individual participation of Kennedy Space Center employees and the centers efforts as an organization, United Way of Brevard County was successful in raising $5.805 million last year, providing funding to many local human services programs provided by United Ways member agencies. At left and at right (respectively) are two of them: the North Brevard Sharing Center and the Brevard Alzheimers Employees make a difference in United Way campaignT he Kennedy Space Center Fitness Centers will sponor the Intercenter Walk/Run beginning at 5 p.m. Oct. 3 at the Shuttle Landing Facility. The 2-mile walk/ run, 5-kilometer run and 10-kilometer run are free for all spaceport employees. Stop by any of the fitness centers by Sept. 29 to preregister, with late registration available at the race. T-shirts may be ordered through Sept. 22 at any NASARun or walk where history is made: 2006 Intercenter Walk/Run is Oct. 3 Exchange store. If you are interested in being a volunteer, call 8677829 or send an e-mail to orrindl@kscems.ksc.nasa.gov Association, which Center Director Jim Kennedy recently visited. with sea turtles for more than 15 years. The nesting and hatching season lasts from May until October. For employees who work near the shore, a simple action like turning off lights when leaving a work area helps. Anybody can preserve marine life and respect the aquatic habitat by not throwing fishing line or garbage in the water, or stranding an animal that was accidentally hooked while fishing. Employees should call 867-2121 if they discover a distressed animal onsite. Regardless of a distressed sea turtles location, call the Fish and Wildlife Centers 24-hour line at 1-888-404-3922. From 8 a.m. to 8 p.m., page workers directly at 1-800-241-4653 and enter the code 274-4867 and your complete phone number. To learn more about federal agencies endangered species responsibilities, visit http://www.fws.gov/Endangered/pubs/ ESA%20BASICS_050806.pdf For tips on what to do if a sick or dead sea turtle is found, visit http://research.myfwc.com/features/ view_article.asp?id=3652 .